This Calgary professional chef and restaurateur wanted to created a smaller, functional version of a professional kitchen for cooking at home. She loved the Professional Line of Viking appliances. The re-designed layout of the space creates a more functional work space and maximizes the storage in this smaller space. 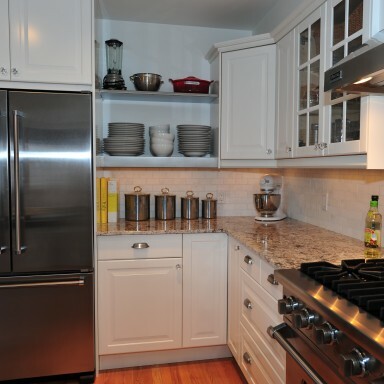 She needed lots of cookbook storage, a pull-out pantry and a loved the idea of using some stainless in the space. We designed and manufactured a custom stainless island counter-top and shelves. The cook zone counter-top is granite with a Carrara subway tile back-splash which speaks to the open plan great room as we utilized Carrara marble mosaic on the fireplace surround. 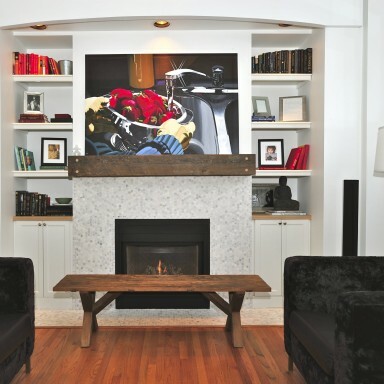 The fireplace mantel is a reclaimed barn beam cut to size. The chairs are custom while the bench is manufactured from reclaimed wood. Re-designed, this layout becomes a functional work space for a professional chef. 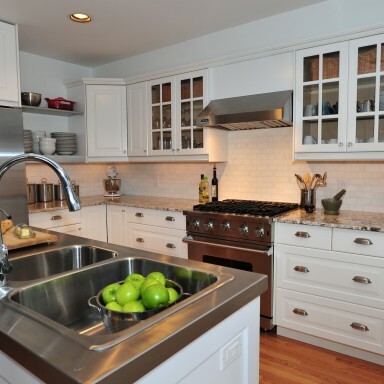 Custom stainless island counter-top and shelving was created to fit perfectly into the space. Professional Viking appliances suit this restauranteur’s sensibilities in her personal kitchen. Cookbook tower and a pull-out pantry maximize storage in a smaller kitchen while the white and grey granite counter-top and white back-splash help the kitchen feel more expansive. Custom stainless shelving houses this chef’s dishes while the Viking appliance package is luxurious in it’s professional attitude. A white and grey granite counter-top with Carrara marble subway tile back-splash integrates perfectly with the stainless surfaces. White on white on soft grey creates an open, expansive feel in this great room. This fabulous fireplace focal point warms the room with the bespoke, reclaimed barn beam mantel and wooden bench. Cararra marble mosaic surrounds the firebox with custom shelving. The chairs are custom and the lamp purchased.